In film imagery, urban spaces show up not only as spatial settings of a story, but also as projected ideas and forms that aim to recreate and capture the spirit of cultures, societies and epochs. Some cinematic cities have even managed to transcend fiction to become part of modern collective memory. Can we imagine a futuristic city not inspired at least remotely by Fritz Lang’s Metropolis? In the same way, ancient Babylon, Troy and Rome can hardly be shaped in popular imagination without conscious or subconscious references to the striking visions of Griffiths’ Intolerance, Petersen’s Troy and Scott’s Gladiator, to mention only a few influential examples. 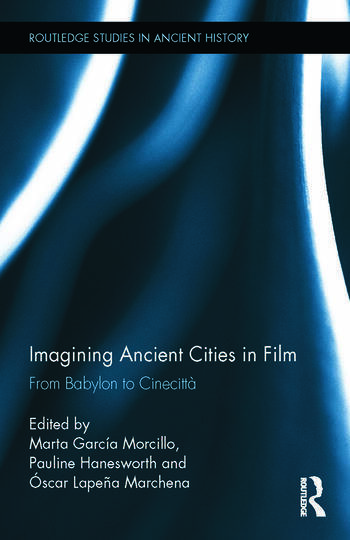 Imagining Ancient Cities in Film explores for the first time in scholarship film representations of cities of the Ancient World from early cinema to the 21st century. The volume analyzes the different choices made by filmmakers, art designers and screen writers to recreate ancient urban spaces as more or less convincing settings of mythical and historical events. In looking behind and beyond intended archaeological accuracy, symbolic fantasy, primitivism, exoticism and Hollywood-esque monumentality, this volume pays particular attention to the depiction of cities as faces of ancient civilizations, but also as containers of moral ideas and cultural fashions deeply rooted in the contemporary zeitgeist and in continuously revisited traditions. Óscar Lapeña Marchena is a Lecturer in Ancient History at the Universidad de Cádiz, Spain. He specialises in the peplum genre and has worked extensively on topics such as Spartacus, Alexander, the ancient city and the Roman Republic in cinema. Among his publications are the monographs El mito de Espartaco: de Capua a Hollywood (2007) and Guida al cinema peplum / Sword and Sandal Movie Guide (2009 and 2012). Marta García Morcillo is a Senior Lecturer in Ancient History at the University of Roehampton, UK. Her research interests are Roman economic history and antiquity in film and visual culture. She has coedited Hellas on Screen (2008) and Seduction and Power: Antiquity in the Visual and Performing Arts (2013). Pauline Hanesworth is an Academic Development Officer at the Higher Education Academy and an Independent Researcher. She specialises in Archaic and Classical Greek myth and religion, and their receptions in the modern worlds. She has published on both as well as on Athens in Central-Eastern European Film.